Diamond Microwave, a specialist in high performance microwave power amplifiers, has announced the launch of a new range of X-band GaN-based pulsed solid-state power amplifiers (SSPA) offering integrated monitoring and protection. Resonant Inc., a late-stage development company creating innovative filter designs for radio frequency front-ends (RFFEs) for the mobile device industry, today announced it named industry sales & marketing veteran, Barry Waxman to its Advisory Board. Resonant formed the advisory board in late August to aid in marketing and commercializing its designs. Fairview Microwave Inc., a supplier of on-demand microwave and RF components, has released an extensive portfolio of in-stock cost effective coaxial packaged low noise RF amplifiers for the availability market. 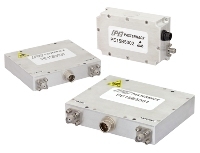 These low noise amplifiers boast outstanding performance that covers wide octave RF frequency bands from 9 KHz to 3 GHz and can be used across multiple markets for a wide variety of applications including electronic warfare, military communications, SATCOM, receivers, fiber optic communication systems, transportation systems, wireless base stations, patient monitoring systems, radio astronomy and university R&D labs. Paul Hart was recently promoted to senior vice president and general manager of Freescale RF.